gaffrig sloop, engine model is a Mercury Bigfoot Prokicker with electric start. Boat comes with 2 sails, 2 burner propane stove, 2 axle trailer with surge disc brakes, sleeps 2, licensed in Canada, 2 batteries a/b switch, mercury big foot has power tilt and trim, motorguide trolling motor w/ 55lb thrust, sink, 5 gal fresh water tank, 5 gal gray water tank. Beautifully crafted fiberglass over plywood construction with lots of varnished wood trim and finishing. Easy to lauch and rig and even easier to trailer. 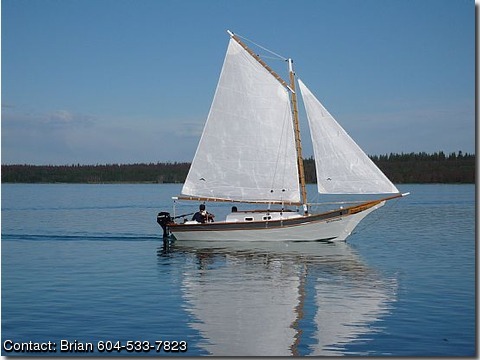 Great for local waters and lake sailing.